Add half of all of the spices, the chicken broth, and bring to a boil. Add veggies and the rest of the spices. Saute for 3-4 minutes. Set aside. When the quinoa is done, stir in the veggies and cheese. Serve topped with a touch of sour cream. 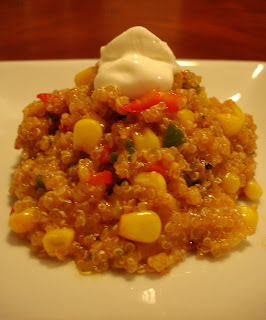 Say goodbye to Mexican rice - this is my new side for Mexican food! So much healthier, deeper flavors, and a nice change from rice. Now the real test...getting Jon to eat it!! I had a lot of fun playing in my kitchen tonight, and it felt great coming up with two recipes that I'd love to share with all of you, and that I'll definitely make again.